> renaming to resolve WAW/WAR hazards without stalling, which implies a Tomasulo machine or similar. > context-switching for A9, so I *know* it implements precise exceptions. > and precise exceptions without some structure equivalent to an ROB in function if not in name. > OoO microarchitectures). The ROB itself isn't particularly power-hungry. > and precise exceptions without an ROB or equivalent? I did some digging and found multiple sources that refer to a 24-entry "data-less ROB" in A9. Unfortunately ARM has pulled down the original documents (particularly the devcon 2007 A9 architecture slides) that those sources refer to. 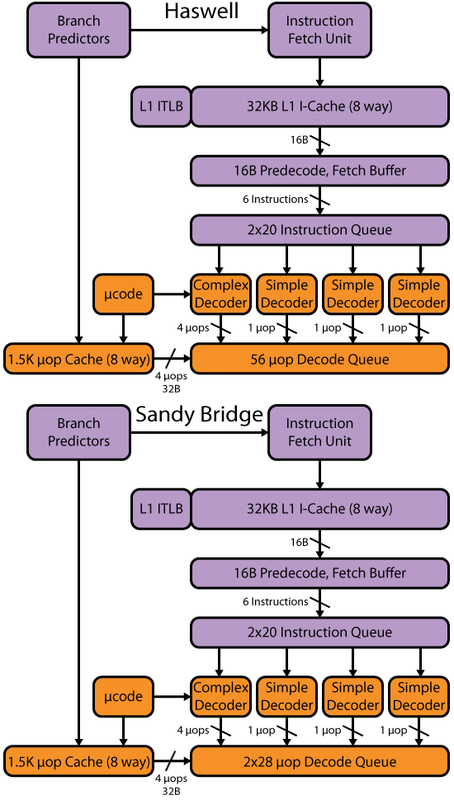 That tends to reinforce what I hypothesized above: It uses a PRF instead of reservation stations and a common results bus, so the ROB only needs to track instruction order and state (speculative or not, written back to PRF or not) as opposed to instruction results Hence "data-less", just like Sandy Bridge, Bobcat, and a whole lot of other modern OoO microarchitectures :-). It's still an ROB, though.